The SD-95 is designed for sidewalks, driveways and other tight applications. It delivers a consistent flow of material directly to the ground, reducing waste and preventing application of the material in unwanted locations. 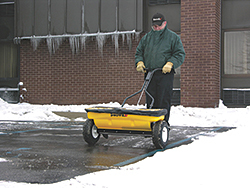 The spreader includes a corrosion-resistant polyethylene hopper, which has a 160-pound capacity. The unit spreads in a 28-inch-wide path and is designed to handle bagged rock salt and pelletized material. The spreader also features an adjustment lever on the handle for changing the material flow more quickly and accurately. It also features a clear hopper cover, which allows the operator to monitor material levels.